People's Television tweeted a picture showing the train (Body 003-B) crashing through the wall of the station. I was watching TV this afternoon when I saw the flash news about the MRT train with body number 003-B crashing through the wall of the station. 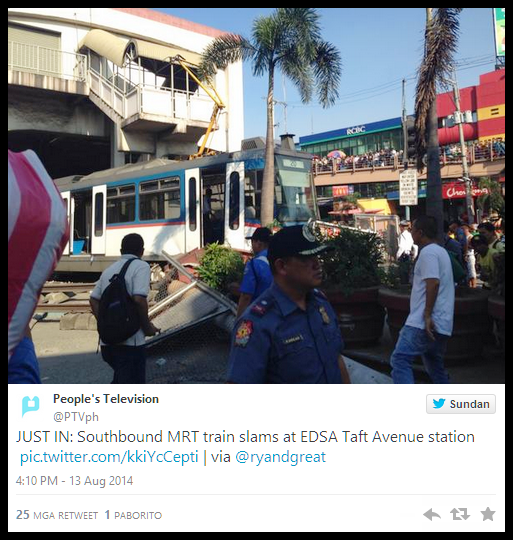 At least four people were reported injured after a defective coach of the Metro Rail Transit in Pasay City went out of control and crashed today, Wednesday afternoon, August 13, 2014. Some of the injured were pedestrians at the corner of EDSA and Taft Avenue who were hit by debris, concrete and glass. Around 4 people were transported to San Juan de Dios Hospital. Some people have chest, arms and face injuries. One of the passengers of the MRT train said many passengers began to feel something was wrong when they saw a spark while the train was passing the Magallanes station in Makati. MRT personnel had passengers get off the defective train, with body number 003-B, before the crash. But as the train was being maneuvered to a depot, it suddenly went out of control, breached the safety line, and hit the wall of the MRT EDSA station in Pasay City. It then hit a concrete lamppost which fell on a sport-utility vehicle with license plate XJH-655. I think this incident will have an effect on the MRT trips in other stations.